Sep 19,2008 : India salutes its brave son, who became a martyr for his motherland. India pays rich tribute to martyr MC Sharma. Long Live Shahid Mohan Chand Sharma!. This is the biggest loss for Delhi police after the death of Ranbir Singh earlier this year. Inspector Sharma(44),, who was killed in Delhi’s Jamia Nagar encounter with terrorists today, was described as one of their finest by the Delhi Police. As per tip off from Gujarat Office, Delhi Police specialist cell stormed into an apartment at Jamia Nagar where 5 terrorists were holed up. Atiq, wanted in connection with the serial blasts in Ahmedabad and Delhi, and one of his associates were also killed, while two managed to escape. One was held and has been taken for the interrogation. Inspector Sharma, who was awarded a Police Gold Medal for gallantry on Republic Day this year by the President of India, has in all received 150 rewards in his police career so far, including seven gallantry medals. He had neutralized 35 terrorists while he was responsible for the arrest of 80 of them. The officer had also neutralized 120 gangsters so far. He was involved in more than 75 gun battles, several involving dreaded gangsters from the badlands of Uttar Pradesh.In his time time, his team solved the Red Fort attack, the Parliament attack, and the 2005 Diwali blasts cases. Sharma had always led from the front. He has shown the way to the Delhi Police. Such was the character and dedication of Sharma, he left his little son sickbed in Delhi’s Kalra Nursing Home with dengue fever saying “I have to rush… I’ll be back in an hour. We have some good leads. Pray for us. We have to get the right men and bring this (bombings) to a stop.”. At that time son was battling for life with urgent need of rare O+ blood. The Special Cell of Delhi Police was formed in 1986, when militancy in Punjab was at its heights. It used to be known as a dumping ground for police officers who either did not perform well or were not in the good books of senior officers. In 1998, things began to change. 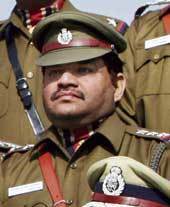 Ashok Chand was appointed DCP. Encounter specialist Rajbir Singh, who had by then made a name for himself, was posted as ACP. Ranbir Singh handpicked his team from officers whom he had worked with earlier. Mohan Chand Sharma, Badrish Dutt, Lalit Mohan Negi, Hridya Bhushan and several others joined. And since then, there has been no looking back..
As per information from Gujarat police the special cell takes position on the buildings around apartment block L-18. Inspector Mohan Chand Sharma, who was not wearing a flak jacket, knocks on the front door of an apartment on the fourth floor of L-18 building. Sharma asks the inmates to come out for police verification. Occupants open fire from a .3 mm pistol. Three bullets hit Sharma; two pass through his body. Sharma falls down as the policemen take shelter. Head Constable Balwan Singh suffers injury on right hand. Following earlier reports that British Telecom (BT) may actually exit its Indian joint venture with Tech Mahindra, new speculations say that the stake may be acquired by Tata Consultancy Services (TCS). BT has 31 percent stake in Tech Mahindra. Analysts say that this development may be due to two reasons. Firstly TCS is strong on the telecom business vertical and secondly BT is a valued customer for the software major. Looking to exit from the Indian venture Tech Mahindra, British Telecom (BT) is understood to have offered its 31% stake to Tata group company TCS. BT may be mulling to exit totally from the venture, sources said, but no confirmation could be obtained either from the British entity or the Indian corporate house. Asked if British telecom had approached with its offer to sell its total or part stake, a TCS spokesperson said “We do not comment on market speculation”. Sources said the approach could have been driven out of synergistic angle as TCS has a thriving telecom practice and most importantly BT is a valued customer of TCS. It is also not clear at this stage whether BT has kept Mahindra & Mahindra, the single largest stakeholder with 44% share in Tech Mahindra, is in the loop about its latest move. Although the valuation of the company has not yet been done by any professional investment banker, the market cap of the company is close to $2.5 billion as per the current share price of firm. At the close of trading on Friday, Tech Mahindra quoted at Rs 759.75, down 2.42% on BSE. Asked if the company has talked to TCS, BT spokesperson stated “BT does not comment on rumours and speculation. BT has operations and investments worldwide which we regularly review. India remains a critical market both for BT and our customers, and we expect to continue developing both the operational network and service that we have established over a number of years”. PS. : Reports direcly taken from some national dailies.